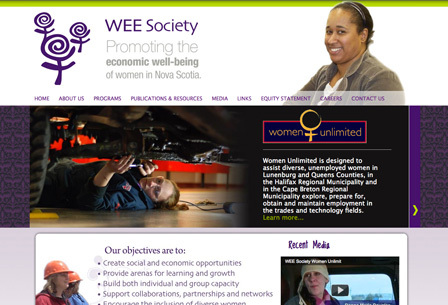 The Women's Economic Equality (WEE) Society was established in 1996. The Society is a registered not-for-profit organization in Nova Scotia. Our goal is to ensure that women of diverse backgrounds are included in Community-based Economic Development (CED) in Nova Scotia. To accomplish this, the Society creates programs and services to support women as they develop new skills, build assets and take their places in the workforce. Their mission is to promote the economic well-being of women in Nova Scotia by facilitating programs and services that support women's full participation in the social and economic development of this province. We have been working with The WEE Society for a few years and their website had become outdated and needed a refresh. The project included a fresh new look as well as social media integration, videos, events calendar and more.